Find and download ID3 tags by sound! Do you still have some songs in your music collection with filenames like track01.mp3 that you cannot recognize? Free Music Tag Finder will take care of that! This simple, smart and absolutely free ID3 tag downloader uses advanced algorithms to recognize your music files by sound and download missing tag information. It does not take into account any existing tags or filenames, which is helpful if your files have completely wrong tags. Thus you can use Free Music Tag Finder to correct existing ID3 tags, or to download missing artist and title information for files without any tags. Free Music Tag Finder is the best way to identify your songs! 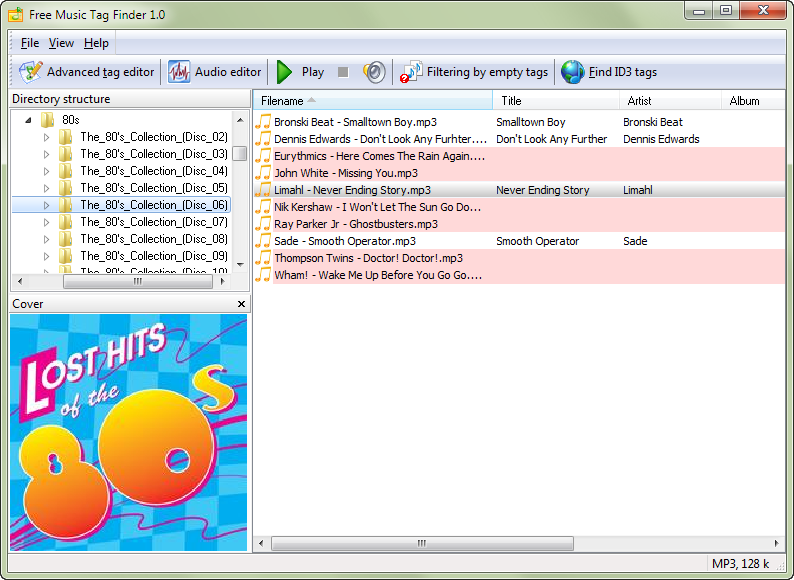 Just start the program, open a folder with songs and select files that you want to tag. The program highlights files without any tags making it easier to see at once what needs to be updated, it can also hide already tagged songs. After selecting files, click the "Find ID3 tags" button. Free Music Tag Finder will start downloading ID3 tags and saving it to your files. The program supports all popular audio formats, including MP3, WMA, M4a, FLAC, APE, and others. Downloaded information is saved in the corresponding format: MP3 tags, FLAC tags, APE tags, etc. This ensures compatibility with other software and hardware capable of recognizing music tags. Download missing tags easily with Free Music Tag Finder! Don't know where to start? Visit our "Quick start" page for illustrated instructions!